How to Translate Website on WordPress? 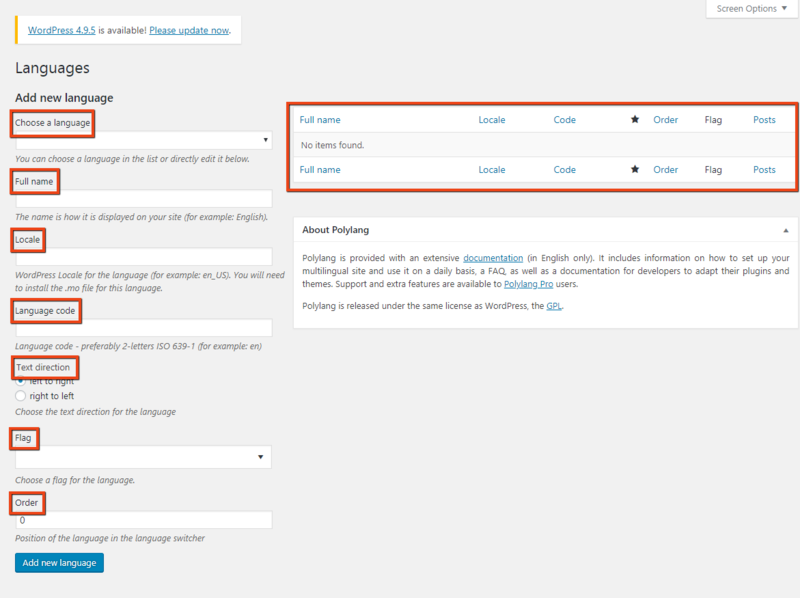 There are a lot of ways you can create a multilingual website on WordPress. You can use plugins that help you synchronize contents in different languages. This actually means that you translate website manually and the relevant plugin synchronizes all the translated content with the original content. Needless to mention, there are plugins that will automatically translate your content with Google Translator. You can also have plugins that are semi-automatic too. These plugins also help you add a widget, to choose different languages, for people visiting on your website. But doing it manually is the most beneficial one. To be honest that again is not the easiest of all activities. It’s like creating one website for one language. That much effort is required. We’ll discuss the manual method. Read this section carefully. As this is going to decide if you are actually willing to convert your uni-language website to a multilingual website. In order to convert; no you don’t actually convert a website to a multilingual website but you are required to write most of the content blocks again in all other languages you want your site to be in. For instance, if your site is in English now and you want to offer Spanish as the other language option to your visitors, you need to write a large portion of your content in Spanish. We’ll see the use of Polylang Plugin and how is that different from WPML. Let’s see what should be your strategy to translate website on WordPress. It is nice if you build your English Version First and make it optimized to search engines. This is because you will have a Master copy to look up to. And then you can translate that content into a different language on that basis. In this way, you will manage to retain a lot of the search engine optimization in the other language too. In this entire article, let’s assume English to be the original language of the website. And we’ll translate website to the other language, for instance, Spanish, Italian etc. I’ll assume you have a fully functional self-hosted website with most of the content in English. If you decide to develop the website in different languages from day one, i.e you want to create pages in all languages simultaneously, that is again great. But let’s assume you have a website in the English language. We are using Polylang for the purpose. Go to your WordPress Dashboard > Plugins > Add New > Search for Polylang > Install > Activate. And you are good to go. As you can see you can choose and add all available language from the drill down in the Choose A Language Section. You can do it one at a time. Once you choose your first language rest of the boxes are automatically populated based on the plugin database. The only thing you need to do here is putting an order of the language. If you don’t want the order now let the value be at 0. At last click on Add New Language to move your selection to the other side of the dialogue box. That is basically the list of language you have selected to translate website into. Point the star to the default language. You can place it with any of the languages you want. 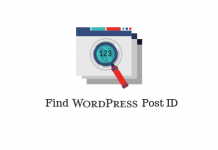 Note: To obtain a successful WordPress website in any language, you should find out, up to which extent WordPress has been translated into that language. You need to install .mo file of the languages you are using. 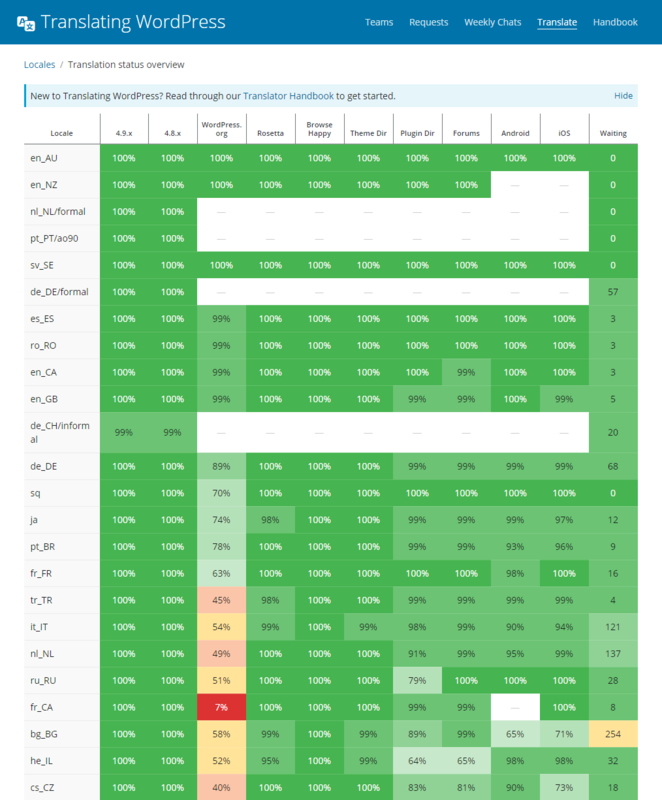 Here are the official stats for all languages and how much of WordPress back-end is translated into that language. So before going for a particular language for the locale, make sure it is completely translated by Polyglot Team. Find the .mo file here. You can also be a part of the translation team or talk to the team members before moving forward. This gives you various options for URL modifications. Check ‘Hide URL language info for default language’ as you won’t want to show ‘en’ written in the pretty link when your site in English. You can also choose to remove ‘language’ written from the URL. When you activate this option the plugin will detect the language of the browser of the user. For instance, anyone using your website in China with Chinese as his/her browser language, the plugin will automatically set to Chinese. You can active language and translation for your media files. In this section, you will find all the content types of your website listed. You need to tick the box to get an option to translate. Let’s see the translation. All the options you choose to synchronize will be synced with the default language. Now since you chose what contents you want to translate and synchronized it, let’s see the changes that were applied to the backend. The list shows the number of posts in Locale language of English. As soon as you go on translating the posts in other languages, you will see other numbers increasing as well. The tick and the plus sign indicates that the plugin is synced and you can click on the plus sign to add a translated copy of that post. Similarly, you can go to media, pages, tags and anything you select to synchronize. As you click on the plus sign shown in the previous image, you get a new editor window. Make sure your theme/editor is compatible with multiple languages. To translate strings, click on Strings Translations. You will get an option to translate all the string available on your website. As you can see in the red boxes, I have translated few strings in different languages. You can use Google Translator for this, but hiring a professional to translate the content will go a long way. Or else you can always do it yourself if you are good at languages. Since the rest of translation is of the same type, I’ll skip detailed translation of pages, menus, tags, categories etc. Let’s just see how the post is translated and widget added. I’ll leave you with screenshots though. 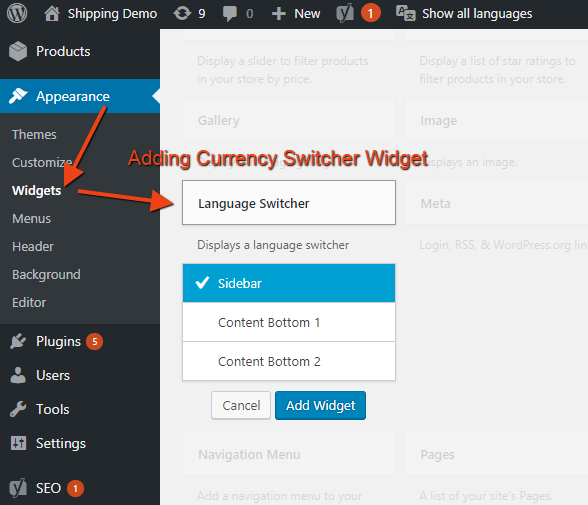 The plugins add the option of Language Switcher in the Widgets Section in the Appearance Tab. Once you add a Currency Switcher Widget, you also get 3 options in the position of the widget. In the sidebar or 2 custom positions in the content’s bottom. Apart from this, you get to choose a title for the Switcher. You also get different options for the display of languages. 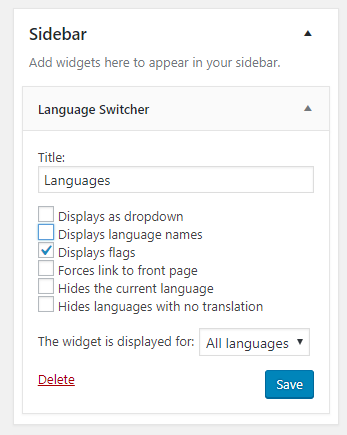 Now that we have got our posts and other contents translated and have added the Language Switcher Wigdet for visitors, let’s see how the plugin works. The .gif below shows the widget and the post title and the post in the chosen language. Other fields also get translated with each translation you make. Now we’ll see how different is WPML? It is a premium plugin and has a subscription charge, with annual renewal charges. Edit Content on the same page, i.e side by side the original copy, unlike Polylang. Easily optimize the translated content for SEO. 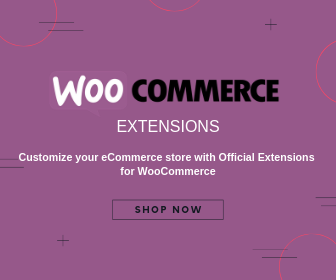 Highly compatible with the best plugins in WooCommerce. In case you decide to translate website manually, choosing a right plugin is going to take time. Here are some of the best free plugins to choose from. There are a lot of ways you can to the translation. So before you start, go for a research of the quality and quantity of content, traffic, and server administration. You should also test the translation on a test site and verify all details. In the test mode, you should also use the same theme and plugins that you are using on the actual website. If you have a plugin that is not compatible with the multilingual plugin, consider upgrading or switching to a better one. Same goes with your theme. At last, since the translation is going to impact the database greatly, create a backup of data before going for the multilingual site. 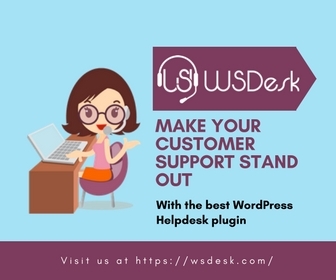 WordPress is the most affordable CMS and provides high-quality design and development on a reasonable budget. Not only that it is also the most stable and secure platforms on the internet. SEO is also a plus point with WordPress, as it has a major share of the internet and e-commerce websites. With plugins, you also can translate website and stand head-to-head with the best websites. 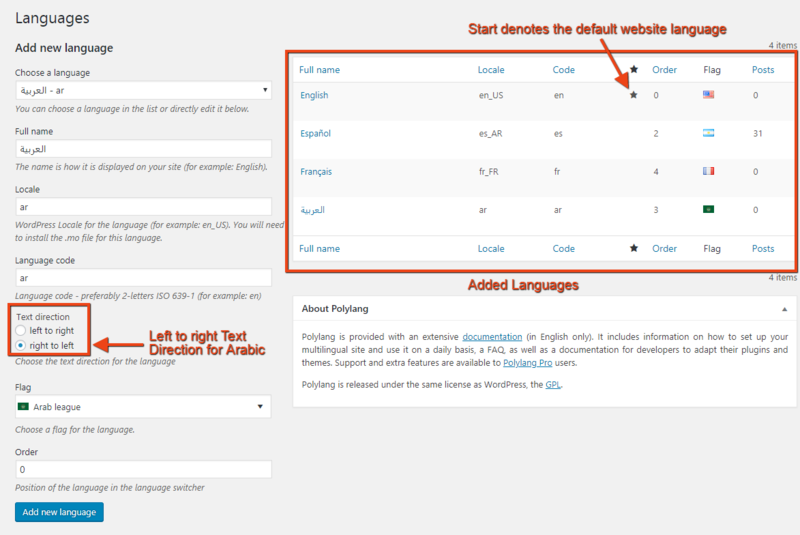 One similar function of plugins in WordPress is Multilingual Website. You get various methods to translate your website. You can take services from professional translation service providers. Or use Ajax Translator Revolution that will auto-translate the content with accuracy. 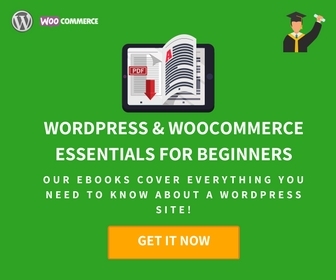 You can also go for a WordPress multisite installation. With this, you will be able to build different sites for different languages without changing your domain name. Here is how you can create that network. Finally, If you want similar tutorials on other methods to translate website on WordPress, let us know through your comments below.